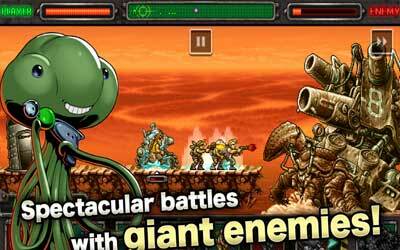 Metal Slug Defense 1.32.0 APK is available in my archive. The latest version gives you new areas, new missions, new units and new languages. This is about the items so it’s better to update it to get it all. This game has a 2D view, but there are many differences Game Play the fame on Android compared with PlayStation and PC versions. In android version we did not play as a character but as a strategist. We are given points which named the AP, these points we use to recruit soldiers in accordance with its value, and every soldier has the capability respectively. Each recruit army soldiers will automatically run automatically and attack the opponent’s defense, do not underestimate the android game because we need a strategy to determine which soldiers should we recruit. Because no army capable to survive and there are capable to attack. You can increase the capabilities of each individual. The higher your level you can recruit tanks, robots and highly capable soldier, or you can directly buy it at the game store. The mechanism of Metal Slug might be a little make true fans of old game should learn something new again, but the display cartoons, music, and characters from the series are present will always remind us of the past when playing this game when I was in high school. It is also present Multiplayer features which you can fight with other online players through the facilities of Google Play. Regular and Rebel Armies clash on Android! More than 60 different characters and units available! The world is your battlefield! Battle in various nostalgic! Level up your troops and armament! Compete with other players in Wi-Fi VS Battles! 25 MILLION DOWNLOAD Commemorative Event “Sleeping Gigantic Weapon”! Parts of a Gigantic Weapon are hidden here and there in this SpecialEvent! Collect them all in order to be rewarded with the Gigantic Weapon “SLUG GIGANT”! Beat the enemy Gigantic Weapon in the last stage in order to release the “REBEL GIGANT” in the SHOP menu! Login every day of the campaign and get up to 250 MEDALS! It’s a great game that you can play anytime and the upgrades are nice. You get medals everyday so you can save up and get exclusive units.